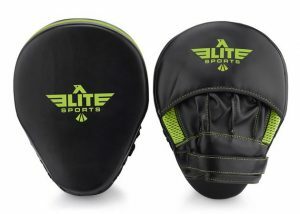 So in the interests of complete transparency, Elite Sports sent me a pair of their Punching Mitts in Neo Yellow and Black. I did not pay for the mitts. In return, they’ve asked me to write about their performance so I’m going to do that as honestly as I can. For a special discount ONLY available to readers of my blog, just enter coupon code THEMORTALMOUSE at checkout for 20% off the price of ANY purchase. 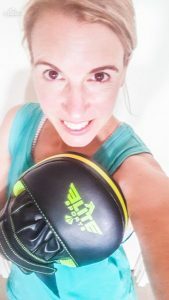 As you may already be aware, I combine boxing workouts with my Taekwondo for the benefits of cross-training. I’ve used quite a few different sets of mitts or pads and can say with absolutely certainty (after having the pleasure of giving these ones a hiding over the past three weeks) they are a cut above the rest in their market. Two main qualities stood out to me and to my boxing buddies as well when they had a crack with them. There’s so much more padding and mesh inside the mitt so they feel really super comfortable and your hands don’t get all sweaty because of the mesh ventilation. Pretty much every single pair of mitts I’ve ever used move around on my hands a lot when they’re being hit. I have to keep pushing them back onto my hands between sets. The chance to tighten the fit with this strap is absolutely brilliant and not a feature I would have expected on a product in this price category. 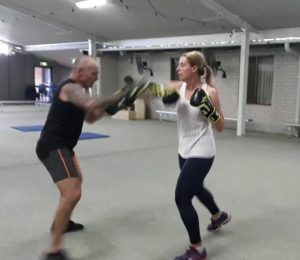 My boxing coach Mick gives them a test run. In addition they are nice and lightweight with a soft outer cover. 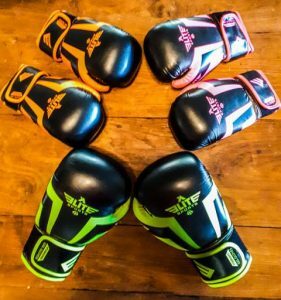 Just like the range of boxing gloves by Elite Sports they are black with a rainbow of feature colour options to choose from so you too can be all matchy matchy like me. Seriously though, as a set, the Elite Sports boxing gloves and punching mitts are both (in my opinion) an excellent buy. Gloves for my whole family! 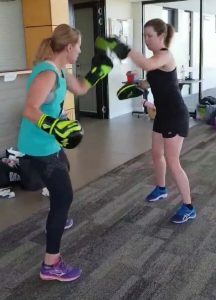 My boxing buddy Michelle gives them a test. She has little hands so really appreciated the adjustable strap.